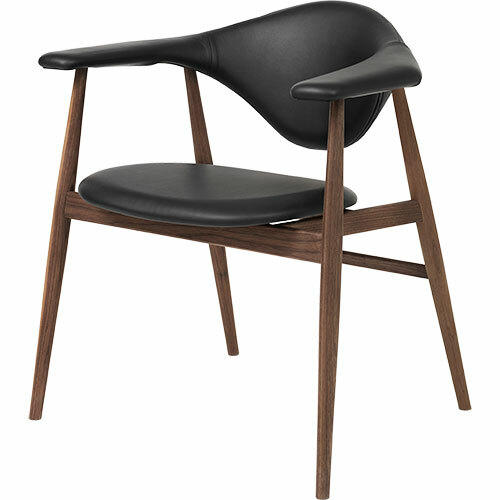 The Masculo Chair by GamFratesi marries the idea of Danish elegance and simplicity with Italian refinement and playfulness. The backrest of Masculo is almost overly large, which call to mind a bull, and appears to float in the air and challenges all senses. This is supported by slender legs that makes the whole chair almost sculptural and exciting to the eye. The upholstered chair ensures a high level of comfort, while its clean legs and sophisticated form lend the chair a graceful presence. Plastic glides included, felt glides available on request. The chair collection is available with wood legs, metal legs, swivel base or sled base. The Collection includes: dining chair or lounge chairs.